I had planned to write an article on a recent return visit to Midway, but when I read our tour leader Joe Van Os’ trip report for the blog on his web-site, I thought I could not say it any better, so I asked Joe for permission to use it for GSW. I was thrilled to once more have the privilege of walking among the albatross on Midway—it was a memorable experience in 2001, and nine years later, it was as unique and special as I had remembered it to be. Permission to visit Midway Atoll National Wildlife Refuge is strictly controlled by the U.S. Fish and Wildlife Service and the Midway Marine National Monument*. After obtaining the required permit and arranging for a 16-person charter plane to ferry us from Honolulu to Midway, here’s what Joe had to say about our experience on Midway. Without a doubt Midway Atoll is a national treasure—one of the top wildlife spectacles to be found in America! Due to previous inaccessibility, this subtropical paradise is virtually unknown to nature photographers and wildlife watchers alike. A visit here is a fantastic opportunity for astounding wildlife experiences and incredible nature imagery! Located 2,800 miles west-southwest of San Francisco, 2,200 miles east of Tokyo and 1,250 miles northwest of Honolulu, the Midway Islands are appropriately named for their strategic location at the midpoint of the Pacific Ocean. Millions of nesting seabirds, and shorebirds migrating from the Arctic, find refuge here as, formerly, did the US Navy. The naval presence focused a great deal of public attention on this isolated outpost in mid-ocean and, indeed, Midway played a pivotal role in the outcome of World War II. In spite of major disruption by war, US Navy operations, installation of giant airplane runways, and several obsolete commercial interests, Midway's birds have remained a constant and amazing presence. Eighteen seabird species that number over two million birds nest on Midway Atoll each year—and of that number almost half a million are Laysan albatrosses. Considering the size of the tiny islands, this is a truly enormous population of breeding birds. When Navy personnel encountered the Laysan albatross during World War II, the bird's ungainly movements on land quickly earned it the nickname "Gooney Bird," and the name stuck. Adult Laysans can weigh more than seven pounds—with a six-foot wingspan. In the air the bird is supremely graceful, but on land it is awkward and unafraid, and visitors to the island have many close encounters. Other photogenic island nesters include black-footed albatrosses (the world’s second largest colony is located here), red-tailed and white-tailed tropicbirds, white and sooty terns, black and brown noddies, red-footed and masked boobies and great frigatebirds. In addition, the clear blue waters of Midway’s lagoon are home to spinner dolphins and green sea turtles—and endangered Hawaiian monk seals are frequently seen basking on the beaches. Migrating bristle-thighed curlews, Pacific golden plovers and ruddy turnstones forage across these islands and wandering tattlers are found along the shoreline. During our visit thousands of albatrosses will be in full courtship display as they size up a potential mate for future nesting. Fuzzy Laysan and black-footed chicks dot the landscape as far as the eye can see. Fantastic aerial maneuvers of courting red-tailed tropicbirds and white terns dazzle all who see them—potential mates and appreciative photographers alike! Bonin petrel burrows are ubiquitous and any soft soil becomes a labyrinth of tunnels containing each pair’s precious single egg. The arrival of thousands of these chattering “gadflies” at dusk heralds their unforgettable haunting of the nighttime sky. The removal of introduced rats from the refuge has doubled the present population to more than 70,000 pairs, and growing—but it’s still a fraction of historical population estimates. “Midway” comprises two main islands—Sand Island and Eastern Island—plus tiny Spit Island. Sand Island is approximately two and a half square miles in size and is inhabited by birds, humans—and more birds. Eastern Island, at 335 acres, is populated only by wildlife. They were designated a National Wildlife Refuge in 1988. In 2006, Midway Atoll was named part of the Northwestern Hawaiian Islands Marine National Monument—recently renamed Papahānaumokuākea Marine National Monument. It is the largest protected marine area in the world. 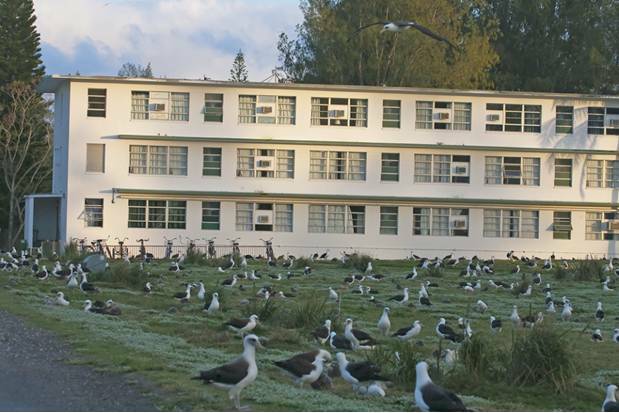 Now, the old Navy barracks have been refurbished and visitors are quite comfortable in the only remote island refuge of this significance in the northern Pacific Ocean that is accessible to photographers. Transportation is on foot, bicycle or in an electric golf cart, with albatross chicks being the only roadway obstacles. The wealth of species and sheer numbers of wildlife here compares to some of the most incredible locations in Antarctica and the Arctic. Yet, the temperatures are balmy; snorkeling with tropical fish and sea turtles is possible, and the birds are extraordinarily accessible. In fact, the lawn of every remaining house on the island is covered with nesting seabirds! I can’t add much more to this except to say that I hope I can go back again to Midway—if you are nature lover, it is a unique and special experience that is embedded in your soul. I’ve added some of my own photos to Joe’s write-up, but to see his photographs from the trip, please visit www.photosafaris.com and check out the blog section on Midway. All photos are property of Isobel Wayrick. To view her other photos, please visit Isobel's Images.